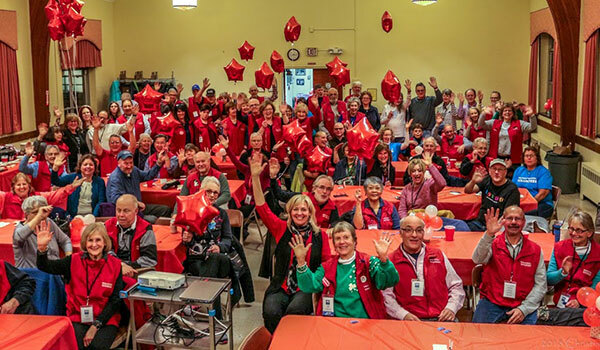 At a recent training session, over 25 new Ambassadors turned out to earn their red vest and help support the operations of the World’s Longest Elevated Pedestrian Bridge. On March 13, The new crew joined veteran Ambassadors for a pot luck dinner to unofficially kick off the season. Ambassadors are specially-trained volunteers who enhance visitor’s Walkway experience in numerous ways. They are tasked with creating a welcoming environment on the Walkway, promoting safety, helping to execute a diverse series of programming, operating the merchandise pavilions, and more. Easily identifiable in their red Walkway vests, the Ambassadors additionally serve as tour guides, greeters, and provide information during times of peak usage at the Walkway, which has attracted nearly four million visitors since it opened in 2009. Walkway Ambassadors support New York State Parks and the many local nonprofit events where thousands of dollars are raised each year. The new Ambassadors will join a cadre of over 150 volunteers. Becoming an Ambassador is a way to meet interesting people while supporting the Walkway mission, which is to enhance the Walkway experience, support capital improvements, and deliver innovative programs that attract visitors and contribute to the economic vitality of the Hudson Valley. Ambassadors must commit to 35 volunteer hours per year, with 16 hours served by staffing one of the merchandise pavilions. Ambassadors in good standing will have the opportunity to go on select field trips to other popular New York State parks and historic sites, as well as the chance to take part in an array of continuing education seminars. After one year of volunteering, Ambassadors are provided continuing education opportunities including CPR and First Aid classes, docent training, and more.